Apple is hosting journalists from around the world next week on September 12 to announce some new products - including what we expect will be the iPhone 8 - but it's the first time the company has held a press event at its new Apple Park location. Below you can see the a video of a drone passing over the new Apple campus, but it also gives a small glimpse at the location of the next iPhone launch. 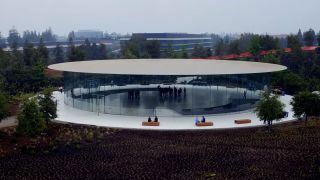 Tim Cook and co will walk out on stage in the newly built Steve Jobs Theater, but it's underground so we don't have a full look at the auditorium. The venue can seat up to a thousand people, but with the shot starting at 38 seconds in the video below you can spot the lobby area for the theater. You then get another better look at the theater at 1 minute and 53 seconds. There are people inside when the video was taken - September 5, around a week ahead of the iPhone 8 launch - so it looks like that may be where everyone will wait before entering the new theater. Apple's lobby looks futuristic - like much of the site - with huge glass walls but there doesn't appear to be much room for over a thousand people at the top so it'll be interesting to see how the company plans to keep people waiting there. September 12 is the expected iPhone 8 launch date where we hope to see a few new versions of the company's phone as well as the Apple Watch 3, Apple 4K TV and hopefully get a release date for iOS 11.